Joel Embiid is the most popular Philly athlete on social media. 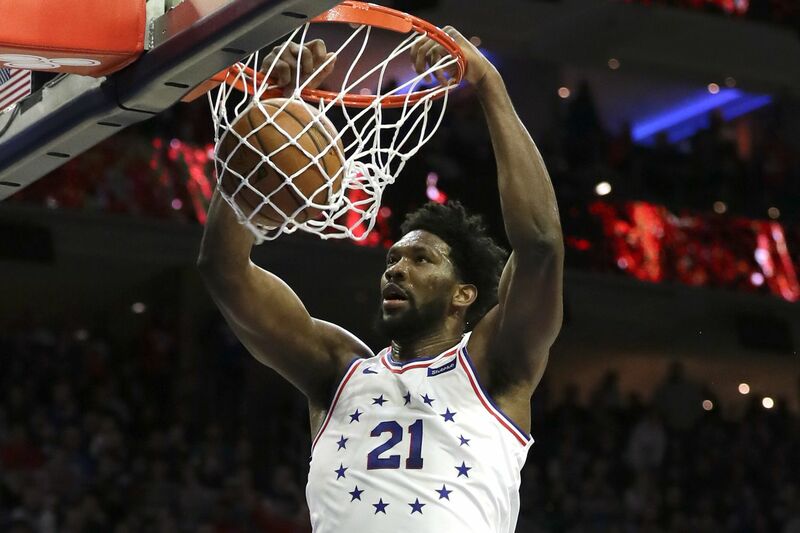 The 76ers’ Joel Embiid, with his 1.6 million Twitter followers and 3.3 million Instagram followers, is one of the most popular U.S. sports stars on social media, according to a new analysis. Axios published a look at the social-media followings for all-stars in the big four pro sports -- MLB, NHL, NBA and NFL. The Lakers’ LeBron James (who just lost to the 76ers, by the way) is far and away the most popular All-Star starter when it comes to social media. His 42.1 million Twitter followers and 46.8 million Instagram followers eclipse players like the Warriors’ Steph Curry (13.1 million on Twitter, 23.8 million on Instagram) and Kevin Durant (17.4 million on Twitter, 10.3 million on Instagram). In fact, the entire top half of the chart is dominated by NBA stars. Leading the way for the NFL is Texans’ star J.J. Watt, with 5.4 million Twitter followers and 3.4 million on Instagram. In 2017, Watt leveraged that following and raised $41.6 million to help Houston recover from Hurricane Harvey. It is the largest crowdsourced fundraiser in history, according to the Houston Chronicle. Despite their popularity in the Philly sports world, free agents Bryce Harper (998,000 on Twitter, 1.4 million on Instagram) and Manny Machado (440,000 on Instagram, and no Twitter profile) don’t rank very high in comparison to the NBA stars. Noted Philly sports fan and Angels star Mike Trout leads the way for MLB stars with 2.5 million Twitter followers and 1.5 million on Instagram. Hockey players, it seems, are the ones who are skipping out on social media. According to Axios’ analysis, 15 All-Star starters don’t have a Twitter or Instagram (or neither!). The Blackhawks’ Patrick Kane has the most Twitter followers (8 million), and the Capitals’ Alex Ovechkin has 2.7 million Twitter followers and another 1.4 million on Instagram. Claude Giroux, the Flyers’ lone All-Star this year, comes in with a modest 773,500 Twitter followers and 84,600 Instagram followers. He’s the most popular Flyer on social media, All-Star or not. Jake Voracek has 92,200 Twitter followers and Sean Couturier and rookie Carter Hart don’t even have Twitter accounts. What about Eagles players? Carson Wentz wasn’t selected to the Pro Bowl, so he wasn’t on the list. But his 1.04 million Twitter followers and 1.1 million Instagram followers lead the way. Chris Long, who spends a lot of time engaging on Twitter, has 589,000 followers and another 395,000 on Instagram. Pro Bowler Zach Ertz has 569,000 followers on Instagram and another 435,000 on Twitter. When it comes to Sixers players besides Joel Embiid, Jimmy Butler and Ben Simmons are the most popular. Butler has just 561,000 Twitter followers but has 3.9 million on Instagram -- that’s more than Embiid. Simmons has 757,000 followers on Twitter and 3.9 million on Instagram (his girlfriend, Kendall Jenner, has a whopping 103.5 million -- good for 13th most in the world as of Tuesday). A number of new Phillies aren’t very active on social media -- Jean Segura hasn’t tweeted since 2017, J.T. Realmuto since 2018. But Andrew McCutchen leads the way with 991,000 Twitter followers and another 170,000 on Instagram. Jake Arrieta adds 460,000 on Twitter and 243,000 on Instagram. Rhys Hoskins has nearly the same amount on both platforms -- 75,000 on Twitter and 74,200 on Instagram. His dog Rookie, an English golden retriever, only has 3,716 Instagram followers, which is disappointing, because he seems like a very good boy. You might remember Rookie from last year’s Home Run Derby. Scott Kingery dog-sat for Hoskins while the slugger was in Washington D.C., and shared photos of Rookie watching his dad on television. Rookie is down in Clearwater, Fla., with Hoskins for spring training and seems to be enjoying himself. All of these numbers, however, are eclipsed once you look outside the big four pro sports. Soccer star Cristiano Ronaldo has 154.6 million followers on Instagram, which makes him the most followed account besides @Instagram, and 76.6 million on Twitter -- eighth-most on the platform, behind pop stars like Lady Gaga, Rihanna and Justin Bieber, and also former president Barack Obama.